and assemble in or outdoors. heater, door with window, accessories, benches and a roof, if outdoors. Our sauna kits are made of 100% Western Red Cedar — frame, too! Watch our "HOW TO BUILD A PREFAB SAUNA" videos. DIY precut custom sauna kit. for step by step expert help. 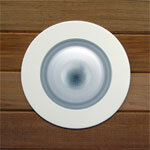 See the sauna accessories included with ALL our kits. 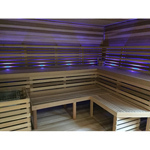 We make a traditional cedar sauna heated with an infrared light — or even combine infrared with an electrical sauna heater if you like a deep sweat too! View all. 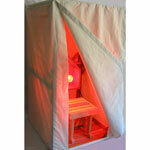 Our Infrared Sauna Tent is for one person — very economical and fits in a small space! Enjoy the infrared health benefits, and great if you prefer your sauna not too hot, or when recovering from an illness. 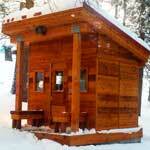 Build a Freestanding Sauna Designed for ALL skill levels. Sets up on cement, pavers, a deck, pressure treated wood or indoors, and can be relocated! Our experts show you step by step how to convert a room into a sauna for your home, spa or commercial location. How? Simply create an account when checking out. Each $1 purchase = 1 point = 5¢. Points never expire! We don't spam you, nor ever share your email and there's no fine print — Just an extra 5% in savings! View our precut and prefab packages including heater, benches, door, etc. Low prices on sauna heaters, plus save an extra 10% on select Polar and Tylo heaters! We sell steam room generators, steam room doors, parts & accessories! Our raised garden beds assemble in minutes but last for years — FREE SHIPPING to the lower 48! DIY Precut Sauna Kits are custom cut tongue'n'groove cedar boards ready to line the walls of an existing room and include all the components needed to complete your sauna *. View the How to Build a Precut Sauna Kit videos. DIY Prefab Modular Sauna Kits set-up quickly making a sturdy freestanding 100% cedar sauna room indoors or outdoors, and can be relocated*. View the How to Build a Prefab Sauna videos. 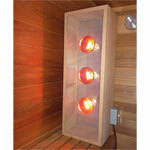 * Our DIY kits also include sauna door, sauna heater, rocks and essential accessories. 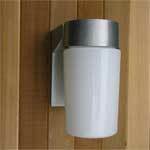 See full list of sauna accessories included. 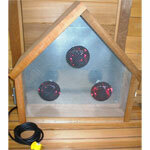 Infrared sauna therapy provides a deep penetrating heat directly toward the sauna bathing area. These sauna cabinets come nearly ready to turn on. These canvas over cedar or hemlock frame tents assemble easily and are an economical alternative for one sauna bather. 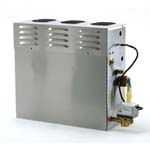 Small but it heats up quickly to 115–125°F. 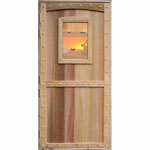 Cedarbrook manufacturers sauna doors for home and spa saunas with an assortment of window sizes available. 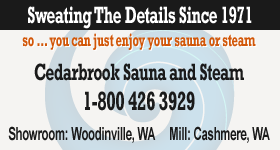 We been building saunas for 40+ years, and steamrooms and installing steamroom doors for nearly 20 years. 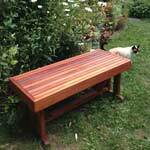 Made with no visible fasteners and come pre-assembled – a cedar bench design that's sturdy and long lasting. Sit and enjoy! 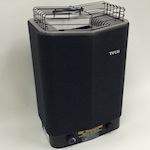 Ideal for storing towels in cool down areas adjoining sauna rooms, or garden tools. Cedar naturally repels insects, great for sweaters and childrens' items. We manufacture sauna benches for home saunas (1"x3" tops) and commercial saunas (2"x2" tops) built with no exposed fasteners. Enjoy the look and feel of cedar patio furniture and planters. The cedar bench is nearly fully assembled. Simply secure the bench ends to the planter boxes and your patio is ready to host. 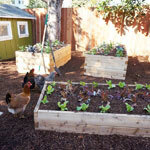 Change your garden in a day — with a raised cedar garden bed kit! The raised cedar bed kits assemble in about 10 minutes, yet the durable all natural western red cedar can last for decades. 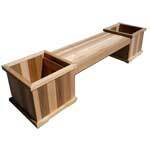 Cedarbrook Sauna and Steam has a full line of 100% cedar raised bed garden kits. SITUATION: You want to get gardening ASAP. Pre-made cedarbeds will make assembly a snap. Our raised cedar garden beds are easy to put together. The ends of the boards are notched so they interlock for superior strength. A variety of sizes are available. We can customize as well! Highlight outdoor living space in a day with cedar planter boxes! Our cedar planter boxes come pre-built ready for soil. No assembly whatsoever is necessary. We make an assortment of sizes for your patio, deck, and wall flower boxes. SITUATION: You want to decorate your outdoor living area, garden, deck, or patio with pre-made cedar planter boxes and plant ASAP. Cedar patio furniture with planters are inviting touch. They're shipped nearly fully assembled. Simply secure the bench ends to the planter boxes and your patio is ready to host. The wall panels are screwed together which form the sauna room. Each panel is 6'8"H x 4"D x Width (flexible and depends on your site's needs, but usually 24" or more). Next, you'll need to wire for your sauna heater. A conduit planned up the wall panel to the ceiling makes it easy to push your wire through. Some choose to just drill access holes thru the panels. Mount or set your heater, and add your benches and you're ready to take a sauna. SITUATION: You're converting a framed closet, a shed or a spare framed room in your house, spa, resort or other facility into a sauna room. DIY construction time: generally an electrical sauna takes 2-4 days if planned well with all materials and components at the ready, excluding room prep work. 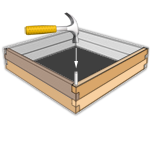 Prep work: If your closet or room has drywall now, you'll need to demo the room down to the studs. Flooring should be a non-permeable material. Plan for location of heater and power source, vents, lights, and bench layout. Wire the room for electricity, and for your heater's requirements. Insulate with fiberglass insulation and a foil vapor barrier. Nail the "pre-cut / custom-cut" cedar boards to the length of your ceiling and walls, thus lining the sauna room with cedar. Normally, cedar paneling is clad horizontally. Continue reading our step-by-step How to Build a Sauna | Convert a Room article and videos. When ready see our How to Order a Precut Sauna Kit.